Map Shows How $650 Billion Will Be Saved By Trump! From sanctuary cities to the mainstream media, to Democrats in the Senate, "sanctuary" is the word of the day, as in, there will be no more sanctuary for those that have betrayed America. One of the goals set forth in Donald Trump's Contract with the American Voter, listed under the "Five actions to restore security and the constitutional rule of law," is to "cancel all funding to sanctuary cities," and with President-Elect Donald Trump's choice of Senator Jeff Sessions for Attorney General, that goal has become a major flash point for the pro-illegal immigration, amnesty supporting, liberal mainstream media. A sanctuary city is described in the following manner by OJJPAC.org: In 1996, the 104th U.S. Congress passed Pub. L. 104-208, also known as the Illegal Immigration Reform and Immigrant Responsibility Act (IIRIRA ). The IIRIRA requires local governments to cooperate with Department of Homeland Security's Immigration and Customs Enforcement (ICE) Agency. Despite the IIRIRA, hundreds of urban, suburban, and rural communities have ignored the law and adopted so-called "sanctuary policies." - Generally, sanctuary policies instruct local or state government employees not to notify the federal government of the presence of illegal aliens living in or passing through their communities, counties, or states. These policies may also blur the legal distinction between legal resident aliens and illegal aliens, so illegal aliens can have access to the same taxpayer funded programs and benefits available to legal permanent resident aliens. TAPPER: Let's turn to sanctuary cities. The city of Los Angeles is home to about half-a-million undocumented immigrants. The chief of the Los Angeles Police Department said that he will not cooperate with federal agents when it comes to deporting them. And Mr. Trump has promised to -- quote -- "cancel all federal funding to sanctuary cities." The city of Los Angeles got $500 million from the federal government last year. Will that money be cut? And when will that happen? Day one? Before addressing the points Priebus makes, lets call a spade a spade shall we? The phrase "undocumented immigrants," is one of the problems that has been noted during the Obama administration where it became governmental policy to avoid the term "illegal" immigrant, despite the fact that immigrants that are "undocumented" are, in fact, those here in America illegally. Amnesty supporters, the mainstream media, and liberals across the board have been attempting to change the proper term of illegal immigrant since well before Obama took office, but when an administration decides to officially water down language in order to make a crime seem more palatable, it is unacceptable. Back to the interview, Priebus accurately points out that any city deliberately ignoring federal law, should not then be handed $500 million by the same federal government whose laws they are blatantly violating. PRIEBUS: Well, that's something for the new administration to decide and something that we're going to all be working on and looking into. But I will say, as a general matter, I totally agree that sanctuary cities -- I mean, the idea that a city would decide to ignore federal law, and then want the federal government to help them anyway, is an inconsistent position for those local governments to continue to engage in. And so I think this is a matter of negotiation. I think it's something that the Trump administration, myself and others included that are the appropriate levels of government, will deal with. But, certainly, I can't imagine that too many Americans are watching this and thinking that it's a good idea for a city to allow for blanket amnesty, ignoring federal law, and then saying, now give me $500 million. No, that's not the way life works. And I think that the Trump administration is going to explore this issue and I think resolve some of these major problems happening all across the country. Full transcript here and that portion of the interview is shown in the short clip below. $500 million is a lot of money, but considering the amount of sanctuary cities spread across America, if federal funding was stripped from them all, that would mean hundreds of billions of dollars that could be used for other purposes, such as infrastructure, or even enforcement of the immigration laws already on the books, laws that the Obama administration has refused to enforce during his term. Democrats are pushing hard to prevent Senator Jeff Sessions from being confirmed by the Senate as President-Elect Trump's Attorney General, once again screaming "racism," but in actuality, their problem with Sessions stems from his outspoken opposition to amnesty, as well as his stringent support for enforcing laws that are already on the books in regards to immigration, to which the Obama administration has ignored and stopped officials from enforcing when he couldn't get them changed legally through Congress. The Washington Examiner explains just a small sample of the laws already established, but have been ignored by Obama, that would would bring a huge change, with no congressional approval needed. 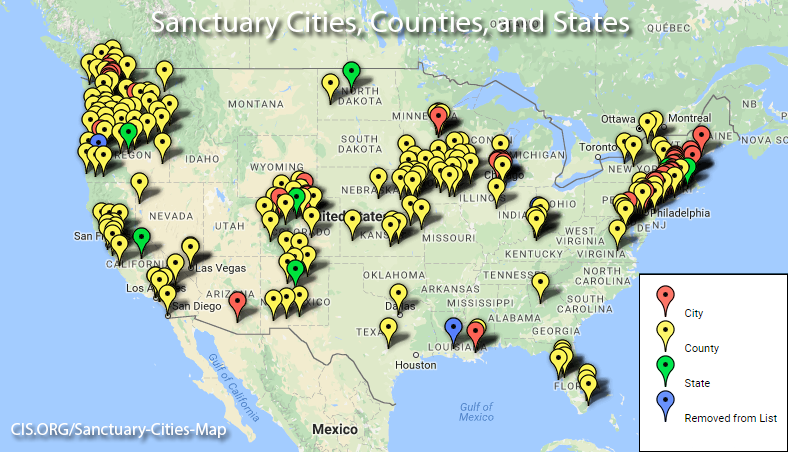 Trump and Sessions may not only cut funding from sanctuary cities, but it is being reported that should Sessions be confirmed, there is a possibility that Sessions will go a step further and actually start prosecuting sanctuary cities. While it is fairly long, the video below from 2015, offers readers a glimpse into Senator Jeff Sessions' positions on illegal immigration, border security, enforcing the laws, and sanctuary cities, as he shreds Secretary of Homeland Security Jeh Johnson on Obama's DHS Immigration Policy at a Oversight hearing on Immigration enforcement. Now Democrats in Congress want to block the confirmation by the Senate of Jeff Sessions, the problem for them is Harry Reid, when he was still the Majority Leader, decided to go "nuclear" in 2013, changing the dynamics of the Senate where it used to require 60 votes for confirmation, after Republicans filibustered Obama nominees. Now it only takes a simply majority to confirm a presidential nominee. At the time, Mitch McConnell, who was then the Senate Minority Leader, said "I say to my friends on the other side of the aisle: you'll regret this. And you may regret it a lot sooner than you think." Now Republicans have the majorities in both the Senate and the House of Representatives, and Democrats are regretting it indeed, because all it will take to confirm Sessions is 51 votes. Republicans hold 51 seats in the Senate, but will have 52 by January since the Louisiana Senate run-off shows Republican state Treasurer John Kennedy holding a comfortable lead over Democratic Public Service Commissioner Foster Campbell. That ladies and gentlemen is the perfect example of the expression "Hoisted by your own petard." By stripping the rights of the minority party in the Senate from being able to filibuster presidential nominees, the Democrats have just lost the "sanctuary" of protection of being able to block any nominee other than Supreme Court nominations, which wasn't included in "The Reid Rule," when he implemented the "nuclear option" back in 2013. Despite the constant lies from the mainstream media, which was accurately dubbed the Hell Stream Media by Steve Quayle long ago, Donald Trump won the presidential election on November 8, 2018, and since that day, the MSM has doubled down, crying wolf at every movement, action and decision Trump has made since that day. It has gotten so bad, that a tabloid writer from the New York Post has actually called them out in a piece titled "Keep crying wolf about Trump, and no one will listen when there’s a real crisis." Nevertheless, a word of neighborly advice to our more genteel media friends, the ones who sit at the high table in their pristine white dinner jackets and ball gowns. You’ve been barfing all over yourselves for a week-and-a-half, and it’s revolting to watch. You know things are pretty bad when a tabloid journalist has to take members of the traditional press to task for hyperbole. One of the constant "concerns" of the hell stream media seems to be over access, where they dedicating hours to bemoaning how Trump is not following their demanded "protocol," insisting that their job is to keep the public "informed," despite the fact that they kept their loyal readers and audience "uninformed" about Trump's chances of winning the Presidential election. Trump on the other hand, via social media and Alternative News outlets, managed to bypass quite successfully in order to keep his supporters informed. Since there is no law regarding presidential access to the President-Elect or a presidential candidate for that matter, there are number of ways Trump can continue to bypass and remove the MSM's "sanctuary" of pretense that they are working for the people, rather than their own personal political agenda and ideology. Deploy the cutting edge of new media—live streaming video on the Web—to make a large populist movement into a huge populist movement. Trump (and perhaps you) do several broadcasts a week directly to the people, bypassing the tired old media networks and putting them further in the dumpster where they belong. The substance of these broadcasts (to the whole world)? A blow-by-blow description of life-lifting programs your administration is putting in place—the ground-and-pound specifics, not the usual high-flying generalities—featuring, of course, comments on the people who are opposing you (by name) and exactly what they’re doing to stop the people’s will. This would be a new kind of reporting and speech-making from the president. I would add another suggestion. Since the MSM continues to pretend that they are simply trying to "inform" the public and that a presidential administration owes it to the public in the name of transparency to allow the liberal press to question, then offer their own interpretation of the answers to their audience, why not set up a process where "we the people" can submit questions to the administration and get our answers, in the name of "transparency," directly from the administration without the liberal spin the MSM has provided to date? The White House website also offers a Press Briefings page, where transcripts of press briefings as well as presidential statements are provided, but take that a step further as well, capture it all on video, offer it there, make it embeddable as well as uploading it to a video platform that allows embeds, where Alternative Media can show all those answers to the public in full rather than just "clips" that allow the MSM to spin their reporting. Let the people listen, see, and decide for themselves if they are satisfied with the answers. If the MSM truly wants transparency, how much more transparent does it get to let "the people" see it all, the good and the bad, and use their own judgment instead of the MSM insisting their audience accept what so-called journalists deem as relevant? Note- While Trump supporters were constantly derided and labeled by the MSM, it is really the MSM's loyal supporters that were betrayed in the worst manner, they trusted them, the listened and because of their misrepresentations, their refusal to acknowledge that polling from other sources, the LA Times and IBD, showed Trump ahead on election day, their supporters and Clinton supporters were caught off guard, totally unprepared for the election results. 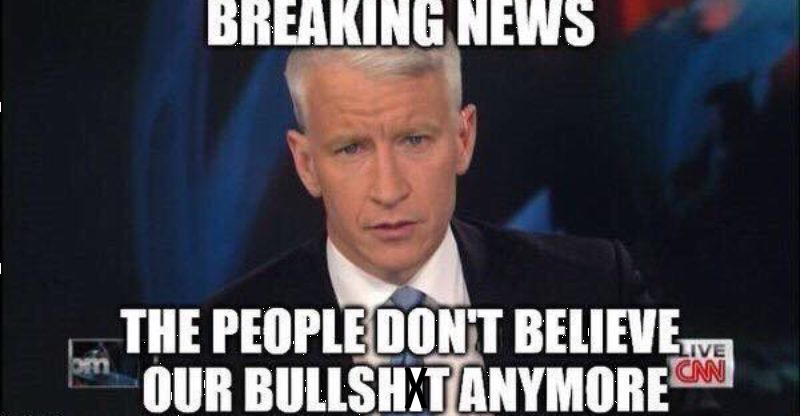 Those loyal MSM supporters should be thinking long and hard about how they were betrayed by those they trusted, and if they choose to stay in their "safe space" by reading the MSM, they get what they deserve. There are no trigger warnings, no safe spaces and no sanctuary for those that betrayed the public, those that violate federal laws and expect to be paid by that same federal government, and those that thought that imposing the "nuclear option" in the Senate would not come back and bite them in the behind. 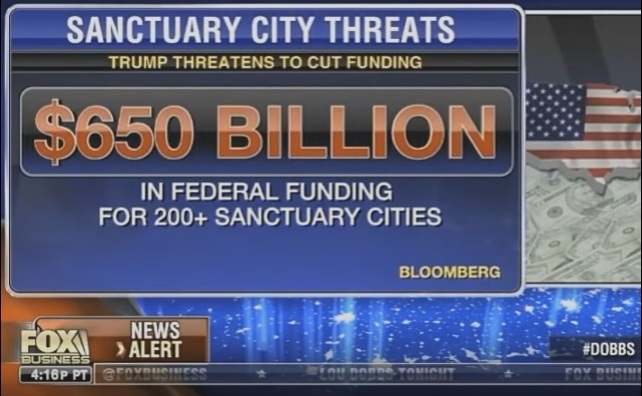 In the video below, Lou Dobbs informs us that sanctuary cities across America receive approximately $650 billion dollars from the federal government. That is money that could be spent on Making America Great Again!